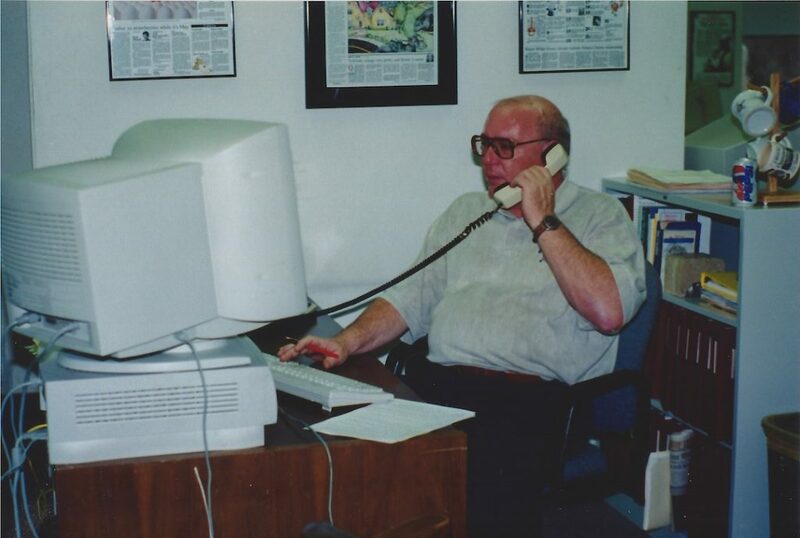 Guy Unangst, early 1998, Arkansas Democrat-Gazette newsroom, Little Rock. “We did? What, us? Nah, there was no –. Who was I? In 2004 I was on the night universal desk of the Northwest edition of the Arkansas Democrat-Gazette. In 1997, the year of the story, I was the new Sunday editor, overseeing the newsroom end of producing the Sunday and Monday editions. Print. Who was the previous Sunday editor? In October 1991, Gannett Inc. closed the Arkansas Gazette, and the Arkansas Democrat bought its assets and became the Arkansas Democrat-Gazette. The Demzette management was determined to not grow complacent as merged papers seemed to do. It helped that Gov. Bill Clinton was elected president and the state newspaper had become relatively prominent. We used that clout to attract better talent. The Democrat had hired me in 1985 as a news copy editor. A year or so later I became assistant wire editor and a year or so after that wire editor, in charge of national and international news, pulled from wire services and the syndicated arms of papers like The New York Times and Washington Post. After 10 years, I begged for a change. Guy, who had worked at some major dailies, was hired as special projects editor to oversee enterprise reporting including investigative pieces. The Demzette around the same time hired another top editor for investigative reporting, and Guy proposed a new job he could also do, Sunday editor. Reporters appreciated Guy, his meticulousness and his fierce loyalty to them. The newsroom’s midlevel editors, however, disliked answering to him on the biggest edition of the week. If there had to be a Sunday editor, make it someone else. Burned-out me was offered that job. The awful part of the new job was managing horizontally, the city and state editors and their assistant editors, all vying for their reporters to have top spots on the Sunday front page. I did this job for just over a year. The first half of which was refereeing these editors who were used to Guy’s pugnacious handling of them. My way was diplomatic, A’s turn this week, then B’s turn next week, calm, logical and, most of all, let’s stay friends after this. The second half of my year went my way after I earned everyone’s trust, but the first half was my career record in stress. I don’t recall what Guy and I were discussing that morning in 1997, but it had to have been about one of his reporter’s stories that he felt wasn’t going to get the prominence he thought it deserved the next Sunday. From out of nowhere, Deputy Managing Editor Frank Fellone (another calm manager) got between us. Frank drove us to what was then the North Little Rock Hilton, which now is the Wyndham Riverfront. It was a buffet. Did any of the morning’s argument come up? No. In February 1998 on my last day, Guy was among several who wore bow ties in my honor. In recent years, when Facebook happened we kept up with one another there. I trust Guy had a good retirement, full of contentment. In his Little Rock years, he was happy after hours, at beer joints with the rest of us newsies, but during the day, he was, shall we say, highly focused. Our newspaper’s obit (also found here), “Guy Unangst: Newspaper Editor ‘Gifted,’ ‘Old School’,” explains some of him. His official funeral home obituary hits more spots very well. Re: Guy – True Story. Email me when you have a moment.